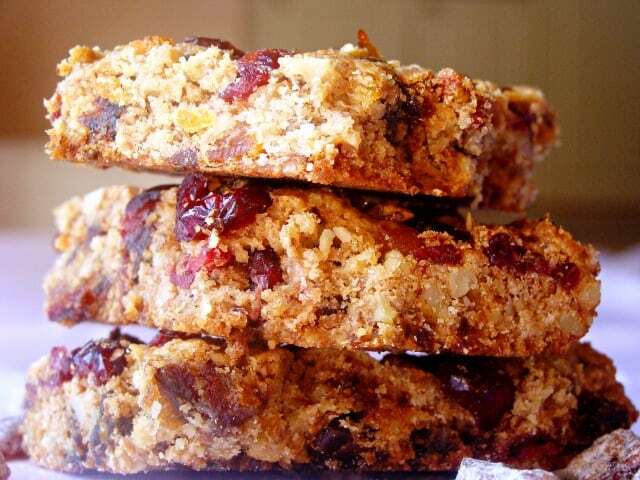 Fruit and Nut Bars – Healthy and delicious breakfast bars loaded with dried fruits and walnuts. While the rest of you are all cookie’d out and working on a healthier menu, I haven’t even started on my sweets binge. I woke up bright and early (6 a.m.) this morning with a massive craving for something sweet. This Fast is really getting to me now (just 3 more days to go!) – I’m dreaming about cookies, steaks, cheese, etc… I bow to you, vegans! 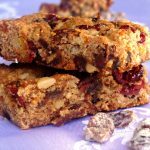 Because I almost always have to satisfy a craving, I flipped through some of my ‘sweets for Fast’ recipes and came across these fruit and nut bars. The original bars are not Fast-compatible, but I used a banana instead of an egg and made them so. However, I did make another batch for the rest of this household by following the original recipe. If you are interested in trying them without the egg, just replace it with one whole mashed banana. Grab a cup of coffee or tea and enjoy! Line an entire 8 x 8 inch baking pan with aluminum foil. Stir in the brown sugar, walnuts, and dried fruit. Use your fingers to make sure that all the fruit and nuts have been coated with the flour mixture. In a separate bowl, with a wire whisk beat the egg and vanilla until light colored and thick. Add the egg mixture to the fruit and nut mixture and mix until all the fruit and nut pieces are coated with the batter. If you are using the banana substitute, mash the banana with a fork real well then add in the vanilla extract. Blend it all together and mix it into the fruit and nut mixture. Spread into the prepared pan, pressing to even it out. Bake for about 40 minutes, or until the batter has pulled away from the sides of the pan. When cooled, lift the bars from the pan by the edges of the aluminum foil. These sound delicious as well as healthy and they are so beautiful with all the jewel like dried fruit! Great recipe :)! 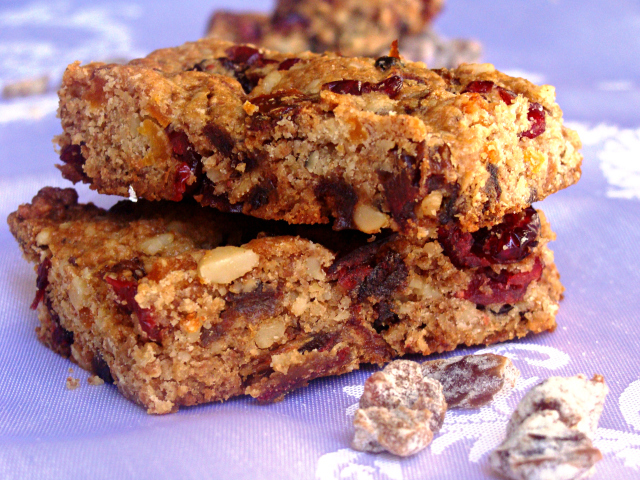 These fruit and nut bars are healthy goodness. Interesting subsituting the egg for a banana. Does it affect the texture at all? I look forward to trying that. Great recipe! Homemade bars is the perfect solution to a healthy go-to snack! I never ate store-bought bars because I was skeptical of the ingredients. The convenience is great and with all those nuts and dried fruit, I bet it would perk you right up during a mid-day slump! Fabulous idea! These look healthy AND delicious. Perfect treats to indulge in after a month of holiday baking. Thank you for sharing such a fun recipe. I hope you have a wonderful Friday and a beautiful weekend! Can you believe that I’ve never been tempted to make my own fruit and nut bars before, until I saw these ones? They are the most delicious-looking health bars ever and I can just imagine how good they taste after a good workout session! These bars sure look terrific, healthy and can totally satisfy a craving for sweets! I like the dried cherries and dates here! Oh I don’t have much of a clue about the chemistry of baking, either :). I just needed something other than an egg that would combine all of the ingredients together and a ripe banana seemed like a pretty good alternative. The heck with my new year resolution who needs to stop eating desserts with this it is perfect! Yeah, I can’t do dieting resolutions :). Moderation… and I just try to make every meal a bit healthier. Right when I saw the first picture, I just knew these bars would be fabulous! By the way, great job sticking to your vegan fast! Do you feel different/better or have more energy? Wow-these def look like they could hit the spot! Kate, this is such a great little treat! 3 more days of fasting? Whew–that’s commitment! These look amazing! I’m never cookied out, so I’m up for giving these a try! So much yummy fruit…these look fabulous. An excellent way to satisfy a craving. These look delicious! Thanks for sharing the recipe. I am always looking for healthier snacks to make for my husband and his triathlon team after their Saturday rides. They are about to start training again so I am sure these will be appreciated. Triathlon! Go Hubby! That’s great! I’m loving this one! What a perfect snack for my daughter during her long dance rehearsals. We will give these a try. Kudos to you on the fast… there is no way I could stick to it. Nicely done!! These bars look awesome! The cherries, dates, and apricot combo sounds delicious. Will definitely have to try this one. Great photos too! These look so fantastic – and I have been craving some crunchy fruit bars so I think these are DEFINITELY the ticket (better run into the kitchen ASAP to whip them up before the craving turns to french fries and/or ice cream and Magic Shell). Thanks so much for the awesome recipe – I can’t wait to try it! What a lovely combination of ingredients… these have to be wonderful! Kate, these look fabulous! A great alternative to store bought granola bars. They are delicious .. they are sitting on the kitchen counter and every time I get near them, I reach for another … yum! These look wonderful! Throw a little oat in there for some slow carbs and you have the perfect pre workout meal. Thanks for posting! Oh I should’ve thought about adding some oat! Thanks for the suggestion! Hey, I like these. Knowing what all is in your food is half the battle toward healthy living. Thanks! Couldn’t agree with you more! I try to make things from scratch as often as possible. Your fasting and eating these? I want your fast – very delicious. the health quotient doesn’t bother me one bit. hehe 🙂 This Fast is a vegan diet… that’s why for my portion of the fruit and nut bars I used a mashed banana instead of the egg. I just found your blog browsing around and am so glad I did! I have made a commitment to myself to eat healthier and am in need of delicious but healthy recipes and it looks like you have tons! These bars look so delicious! You can’t go wrong with cherries and those flavors. Healthy, delicious and full of good stuff. After all the crap I ate during the holidays, I need something good! These bars look delicious! I loooove dates and dried cherries :). These look awesome. They remind me of a cookie my aunt has always made. The combination of fruits and nuts, and the squishiness of the cookie is addictive. Wow, these look wonderfully sweet and tasty, but healthy too. Great job! Kate, these bars are just great – great taste and great look!!! I love dried fruits and nuts combination! Thanks so much for the comment! My son’s girlfriend is very interested in your site. I recommended you!. Those cookies look fantastic! Awww thank you! And thank you for that yummy Blueberry-Lemon Cream Parfait! Oooh, I loved dried apricots AND dried cherries! Thanks for sharing! Ooooh spied pumpkin granola – that sounds goooood! What gorgeous colors on those dried fruits! This looks so yummy! These look amazing! With or without the egg! I often crave something fresh baked but find myself out of eggs… but not ripe bananas. What a great recipe to have for those times! Or whan I’m not out of eggs for that matter! They taste great with the banana. It changes up the flavor, but it’s still delicious! Ok, see, those may be a sweet treat, but with all those fruits and nuts in there, you can’t tell me they’re not healthy too! 🙂 They do look fantastic and since I’m not vegan, no reason to change anything. Thanks! Oh see, apart from being tasty, I should’ve mentioned that these are really healthy, too!